It is true that your work is not who you are, it’s what you do. You are much more valuable as a person than any title you may have in the world of work. Yet, our jobs are an important AOF™ (area of focus) in our lives. Whether we are stay-at-home parents, ditch diggers, movie stars or professionals in business, we will not feel a true sense of joy if we have not made an informed decision surrounding our work choices. How do we do that? The first thing to do is gather information about ourselves. What are our values, interests, personality types, and talents? In my seven years as a Career Consultant, I was able to experience the joy my clients felt once they focused on these four key points of information and how they overlapped. With this knowledge, they moved on to making the best decision possible for themselves concerning their career choices. You can do this too. Take some time to find out what your values are in life (location, prestige, financials, people?) there are tools available online (do a search on free values inventories) to assist you in narrowing down your key values. Next, consider what interests you the most. Working with your hands? Theoretical concepts? Teaching? Speaking or writing? You can take an online interest inventory such as the one based on Holland’s RIASEC codes to determine your top interests. Once you have a good feel for your interests and values, take an online test such as Myers-Briggs to figure out your personality style. For example, are you introverted or extraverted? This will make a difference in choosing work in certain fields. Finally, consider your aptitudes and natural talents. What have you always been good at? What types of activities come easily and naturally to you? It is best to take some sort of objective assessment on aptitudes, but if you aren’t able to do that, spend time thinking subjectively about which natural abilities you possess. You may want to ask friends and family what they have noticed about you in this area, as well. Once you have your interests, personality style, values and abilities before you, begin to look for overlapping themes among them. This is how you will figure out the best options for you as far as educational and career choices. I say options, because there will be a few ideas that arise for you. Take those ideas and investigate them. Narrow down your choices based on the research you do, and you will be making the best decision possible for yourself. Keep in mind that your choices may change throughout the years, and repeat the process above as necessary. 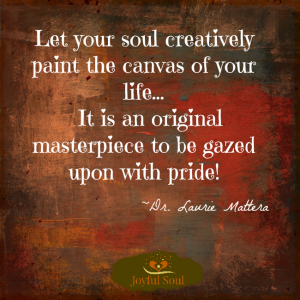 If you need guidance and assistance through this process, contact me at Drmattera@joyfulsoulonline.com to set up a session with me. I can help you through the results you get and assist you in narrowing down your choice. Knowing that you have made the best decision possible for yourself in the world of work and having a plan for your future work life helps bring JOY in every other aspect of your life. You deserve the peace that comes with knowing you have made the best choice for yourself in the world of work! Dr. Mattera: I really appreciated going over everything with you a couple weeks ago. I am beginning to understand myself more. I honestly believe it will still take time for all of it to sink in. However, I am feeling pretty confident about things now. Again, I really appreciate the time and effort you put into working with me. I will definitely contact you when other questions pop up. Thanks again! Dr. Mattera has shown the ability to maintain balance and integrity. She takes her many different responsibilities seriously and shows a persistence to achieve in all aspects of her life. She is intuitive, sensitive and has a great sense of humor. These qualities all add value when working with others, whether colleagues or clients. She is dedicated to performing excellent work and holds high standards for herself and others. Dr. Mattera has demonstrated the capacity to communicate effectively with many clients over the years. She conducted educational workshops for educators and high school guidance personnel and was always rated as outstanding. Dr. Mattera is a multitalented professional who would be an asset to any organization. She has successfully integrated a lifetime of experiences and education into wisdom in working with others. A huge thank you to you on behalf of myself & my husband. After considering all that you said, our son has taken what you said to heart…your evaluation has given him a base on which to consider his future. Before his consultation with you he just couldn’t get focused, the world was too big and the possibilities too many. Until you spoke with him I don’t think he could see himself in any jobs he had considered. But now he has been reading the information in the notebook, doing some reading online and talking about his future in a way we’ve never seen. He has set 30 day goals for himself. You were able to connect with him in a way nobody else has been able to do. If you weren’t so wonderful at engaging him in a meaningful conversation it would have all been for naught. Perhaps later on he might want to come back and speak with you when he has narrowed his focus more. 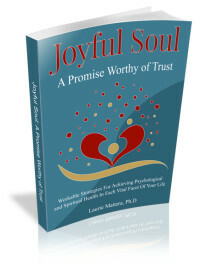 Joyful Soul: A Promise Worthy of Trust. Disclaimer:Although Dr. Mattera has a Ph.D. in Counseling Psychology and extensive experience counseling others, the telephone sessions offered with her are considered consultations and coaching/guidance sessions. They are designed to help adults with problems in their daily life find joy and balance. If you are experiencing deeper issues, seek mental health counseling with a trained professional. Visit www.apa.org in order to locate a psychologist in your area. In an emergency, dial 911 or go directly to the emergency room of your local hospital.